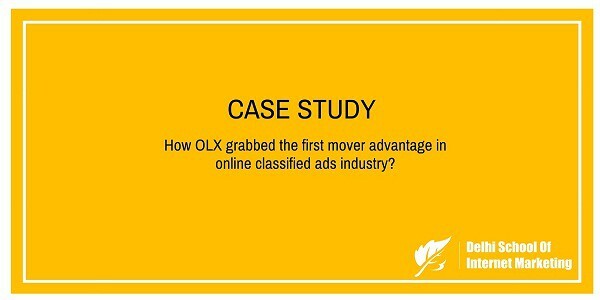 CASE STUDY:-How OLX grabbed the first mover advantage in online classified ads industry? Home > Blog > Blog > CASE STUDY:-How OLX grabbed the first mover advantage in online classified ads industry? OLX has quickly become a household name in emerging markets. OLX has reached a milestone that puts it in the same category of Instagram, Facebook Messenger, and Snapchat: 200 million monthly active users. Founded in 2006, the company has grown to 1,200 employees and operates in 150 countries. With over 11 billion page views, 30 million listings, and 10 million transactions per month, it is the largest marketplace in India, Poland, and, Brazil. OLX is free to use and makes money selling promoted listings to users. According to the founder Mr. Oxenford, he saw US and a few countries in Western Europe had made pretty big transitions from paid classifieds in newspapers to paid vertical real estate or job sites and free horizontal classifieds sites. On the other hand, in Latin American, Eastern Europe, South East Asia etcetera, the opportunities seemed to be there but Craigslist or eBay were not going to these markets. So he took the opportunity to copy the concept, improve it, make it appropriate for each local market and then deploy it globally. And OLX was the result. OLX was co-founded in 2006 by Fabrice Grinda and Alec Oxenford. They wanted to create a secure platform for trade featuring no costs for the users. This site has seen major success in the past years especially in India, Nigeria, Kenya and South Africa. The company has given its own slogan which is very popular ‘sell it’ as they try to woo people into selling their stuff that they do not need through the OLX classifieds site. OLX is so popular that it is used in more than 150 countries in as many as 40 languages. OLX has seen tremendous growth in India. The site is easy to navigate and focuses on mobile and proper advertising. Their unique communication strategy ensures total brand appeal across the board. Olx can be used by anyone regardless their social, cultural and geographical status. According to Amarjit Singh Batra, CEO of OLX India, the marketing strategies in the past two years have brought out good results. They are proud to penetrate both big and small markets. They enjoy so much customer loyalty due to efficiency and proper marketing. Statistics show that there are items being sold on this site every few hours. You are allowed to post a free ad on the site and leave your contact information. Once this is done, all you have to do is sit back and wait for a buyer to call. OLX does not act as a middleman but rather marketplace. People actually give testimonials of how they sold and bought stuff on this classifieds site with incredible ease. In India, the website gets 2.5 billion page-views a month, as on August 2015. Besides India, OLX also does well in countries like Kenya, Nigeria and South Africa. This success can be attributed to the unique organizational strategy used by its founders. They have a super lean organizational structure where the business resources are absolutely committed to its growth. Should what Mckinsey predicted come true, OLX will emerge very strong and in no time, OLX will command a huge user base of nearly 200 million users and will acquire 80% of the market share and will join the big leagues like LinkedIn and twitter. OLX was profitable four years ago, but was only growing by 70% to 80% each year. Citing the potential for competition, Oxenford decided that slow, organic growth was actually more risky than fast-paced, advertising-fueled growth. “If people had understood what we were doing before, we would have had a lot more competition,” he says. So OLX sold itself to Naspers to fund faster, less profitable growth with TV advertising. Since the launch of its first television ad 3.5 years ago, the traffic of olx.in has grown 150 times, the company claims. To promote the brand, the company has been using offline advertising media like road side banners and partnering with cricket teams in IPL. Since in the initial days, internet penetration was low in India, the company decided to use TV’s massive reach to educate prospective consumers and help in creation of the market. The company then started 360-degree marketing campaigns to engage with customers in various parts of the country. Not stopping there, the company has been using social media to remain in regular touch with social media consumers. Since recent growth of the Internet has been happening through the mobile platform, the company has also been the front-runners with focus on mobility devices. Today, OLX is available to users who don’t have access to laptops, broadband & PCs. Talking about the revenue model of the company, Mr Amarjit Singh Batra said, “We are in search business so when you come to our site you are looking for something, and if we put ads related to your search we’re going to get a very high click-through rate. On the internet, search business models can work if you have intent, and when you come to OLX you have intent in the right categories: cars, jobs, real estate etcetera. The combination of having intent plus being in value-laden categories leads to high CPM”. After almost nine years of free service, this online classifieds company has decided to monetize its business in India by introducing advertisements and paid listings in 2015-16. Nasper-backed OLX has listed close to 1.5 billion ads till December and currently has close to 2.6 million live commercials for mobile phones and computer tablets. OLX started operations in India in 2006. The company announced its first round of funding on September 1 2007. It had raised $10 million from four different investors including General Capital Partners. The funds received in the initial point of the company helped it in gaining popularity and increasing its target audience. Then again in series B round of funding the company y raised $13.5 million from the same investor which was announced on April 11, 2008. Working hardly under the supervision of its founders, the company slowly became operation in many countries. With the increased user base, the company managed its website for larger traffic to handle. Then in May 2009, the company raised $5 million from the same investors and one more new investor. Soon in August 2010, the company raised an undisclosed amount from Naspers. In the early years of online classifieds, verticals such as jobs and matrimonial helped the transition of consumers from newspapers to online. However, now consumers are moving to horizontal classified platforms that address their multiple needs much faster at a single place. The consumer also likes to browse around, see a variety of products, negotiate on price, and see value in the product before the final transaction. This again offers a huge opportunity for a horizontal classifieds platform like Olx that helps the consumer in all these things. A variety of such factors will lead to continued growth in digital classifieds which really speaking is a simple, mass market form of e-Commerce.So, there is a continuous growth in the online classifieds industry and online classifieds business is the best business idea to start earning money.